The original Synthasystem - like early units from Moog, Korg, and Yamaha - used S-Triggers for their gate signals. Most other (and modern) synthesizers use V-Triggers. There's a more in-depth discussion here, but basically... V-Triggers are at 0V while at rest, and +5V when active. S-Triggers, on the other hand, short to ground when active. Theoretically S-Triggers are supposed to be at +5V or something when at rest, but in my experience it can be floating too. The way I see it, both systems have their advantages and disadvantages. V-Triggers allow you to use the same sort of signal everywhere: everything is a voltage! 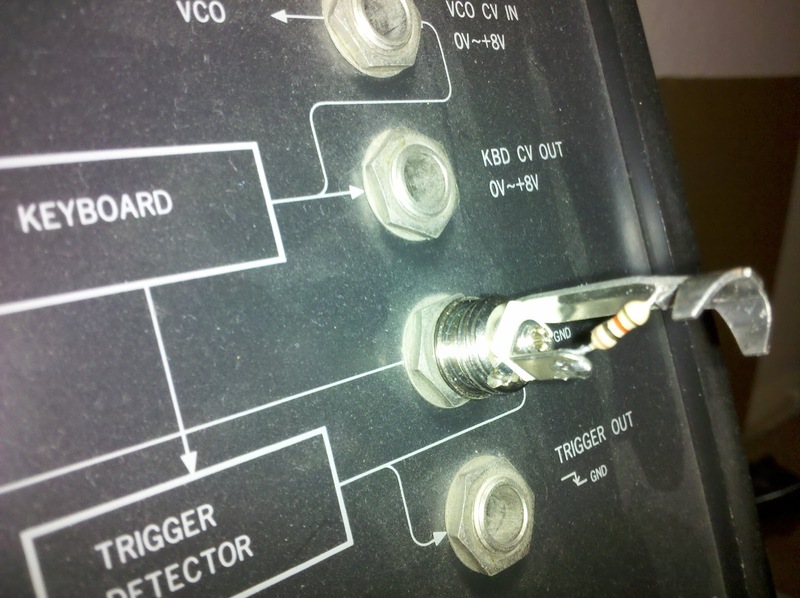 Plus, most V-Trigger systems use comparators on the input, so you don't have to use an explicit gate signal. S-Triggers, though, allow you to passively OR gate signals without any problems, and the signal can be created passively. It is easy to generate an S-Trigger signal. I've made a few shorted 1/4" plugs for my MS-10. With banana jacks that isn't as easy, though you can (of course) plug an input into a ground jack. That being said, however, the Synthasystem's VC Trigger Generator makes trigger generation quite simple (manual, LFO, gated, etc.). If you're still afraid of S-Triggers, let it be known that the Synthasystem PCBs have added circuitry to allow for V-Triggers as well. They come off of different headers as well, so if you need to switch, it is easy. The only exception is the sequencer, but there's an additional board to provide the conversions. I'll be going with the S-Triggers, mostly since it think it would be fun to have a modular using those. I am adding the components for the V-Triggers (for completeness), but won't be using them. (Though they could be useful if debugging.) So that I don't ever confuse myself, I'll also be using red banana jacks for all of the trigger inputs & outputs.